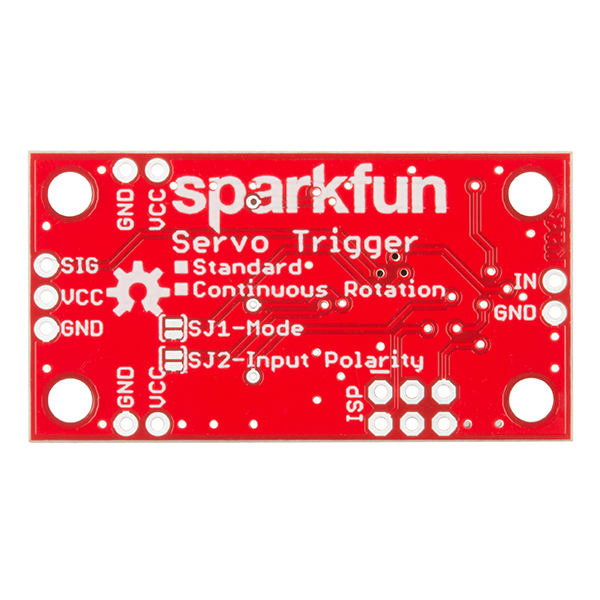 The SparkFun Servo Trigger is a small robotics board that simplifies the control of hobby RC servo motors. When an external switch or logic signal changes state, the Servo Trigger is able to tell an attached servo motor to move from position A to position B. 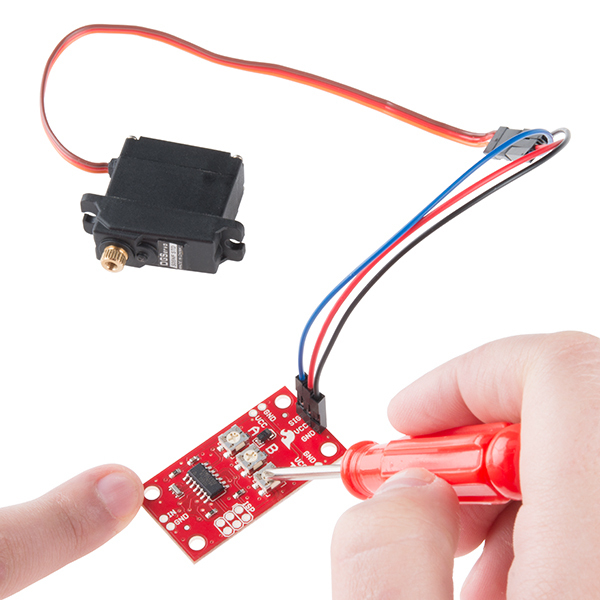 To use the Servo Trigger, you simply connect a hobby servo and a switch, then use the on-board potentiometers to adjust the start/stop positions and the transition time. You can use a hobby servos in your projects without having to do any programming! The heart of the Servo Trigger is an Atmel ATTiny84 microcontroller, running a small program that implements the servo control features we are discussing here. On-board each Servo Trigger you will find three potentiometers, "A" sets the position the servo sits in while the switch is open, "B" sets the position the servo moves to when the switch is closed, and "T" sets the time it takes to get from A to B and back. Compared to a servo motor, the Servo Trigger board draws very little current, roughly 5 mA at 5V. Be sure to note that if you’re using the Servo Trigger to control your motor, the absolute maximum supply voltage that should be applied is 5.5 VDC. 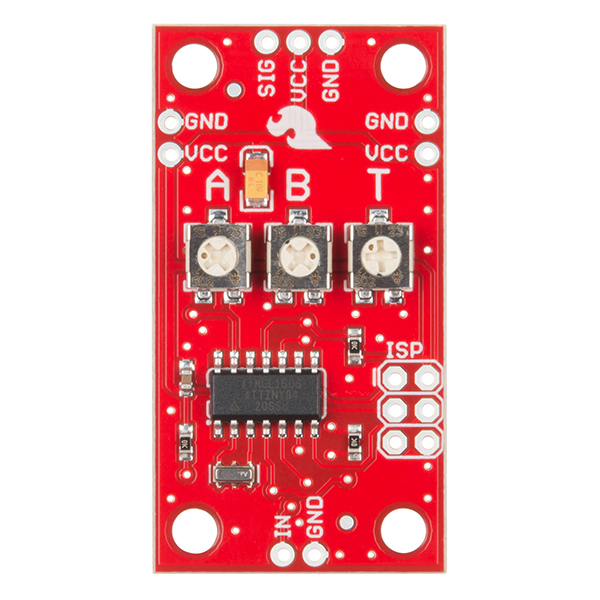 Additionally, the SparkFun Servo Trigger is designed to make it easy to daisy chain boards – you can simply connect the VCC and GND pads on adjacent boards to each other. Note: Check out the Hookup Guide in the Documents section below for more advanced tips, configurations, and modes! How to use the SparkFun Servo Trigger to control a vast array of Servo Motors, without any programming! Looking under the hood of the Servo Trigger -- using the development environment and some finer details of the firmware. Can I make it go 180 degrees? Program the Servo Trigger with this hex file to enable 180 degree rotation. I have assembled the servo trigger, programmed it and it's not working. I am now trying to understand the reason - any help would be highly appreciated. What happens - when I connect power, the servo keeps going in one direction. When I enable input, it doesn't change the direction. I haven't soldered any of the SJ jumpers - everything is left by default. I assembled everything based on the picture on the main page. 10uF capacitor is soldered as on the picture. 0.1uF capacitor polarity as well as resistor and resonator polarity is not important (correct me if am wrong). As for Attiny chip - I have soldered it as shown on the picture (is this the correct orientation?) I have used Attiny84A instead of Attiny84. I didn't change anything in the project in Atmel Studio and flashed the chip as Attiny84. Do I need to change anything in the project for Attiny84A. And if so, what exactly? I have used USBASP programmer to flash the chip. I am not sure it supports Attiny84A but it showed that flashing was done successfully - fuses etc. Also what mode should I use If I would like to have the following - when I press the button servo goes from A to B, when I press the button one more time servo returns from B to A. Should I use the default settings? Sorry, it's hard to understand the explanation about modes since I am not a native speaker. Thank you very much in advance. Please sparkfun team, help me - the servo moves in one direction when I power it on - no reaction to trimpot adjustments. I don't know what to do. While the comment sections are great for customer support they are not a good way to contact our support team. Please email techsupport@sparkfun.com if you are having problems. The pictures on our site are taken of boards that have come off our production line so all parts should be oriented and assembled exactly like they would on a shipped board. I believe the Attiny84 and Attiny84A are pin compatible so that shouldn't be an issue. Check if the Attiny84A is listed as an option in your programming environment as sometimes you can't upload code unless you have the exact chip name. As for your scenario it sounds like what you want is a locking button and not a momentary one. The board is designed to move from A to B when the button is pressed and from B to A when the button is not pressed. Again, if you have more questions I would recommend emailing our techsupport department. Send an email 3 days ago, no reply yet. Could you please kindly check Case #255099? I understood what seems to be the trouble - I tried to read fuses and for some reason I got this message: avrdude.exe: "fuse" memory type not defined for part "ATtiny84"
Meaning that probably fuses are missing or my usbasp programmer can't read them? How do I set up fuses for this project? Servo Trigger firmware on the Arduino: I've ported the firmware written by Byron Jacquot for this excellent device. It will control 2 servo motors (pin 9 and pin10 using Timer 1) with independent FSMs and software configurable settings. It's a prototype for a larger project, but this was a great place to start. Could you post dimensions for this board? Apologies if I've missed them. The board outline is 1.7" by 0.9". The mounting holes are 0.125" in from each corner, and 0.13" in diameter, for 4-40 machine screws. The dimensions are in the Eagle BRD file. Turn on layer 47 ("Measures") to see them. Could this board be used with an Arduino to trigger its input? How would it be hooked up? Where were you guys a decade ago when I made this circuit out of 555s? Could have saved me an afternoon of grief. Might I suggest you take your circuit and sell it to the physics folks around the world that are using it in their fancy science learning machines -- it's a far more elegant solution than mine. Although sometimes its worthwhile to ground the power/signal leads for experiments as it prevents erroneous signal noise in high sensitivity environments. It sounds like something isn't right. It should power up without issues. What servo motor are you using? Also, what power supply are you using? If you can provide links or part numbers for those, I can try to recreate the situation here. Since you encounter problems when you power everything up together, but it works OK if you power up the trigger, then add the servo, it sounds like there might be some startup interaction between the motor and the power supply. If you have an oscilloscope (or even a DC voltmeter), watch the 5V line while you power up, and see what happens - if it dips or spikes, it might be causing the servo or trigger to get confused. I've seen servos draw an amp or more right when they start, then settle to a much more reasonable draw, maybe 20 mA. There's some more info about this in the hookup guide, in the Power Notes section. If you can substitute a different servo or power supply (like 3 flashlight batteries), that might help isolate what's going wrong. This product is super clever. Nice job. For model railroad applications, this controller is perfect for driving servos connected to turnouts (switches) or semaphore (signal) blades. Some suggestions: - Replace the pots with header pins, which tie through a ribbon cable, to a button/pot programming pendant. Save position values in Flash. 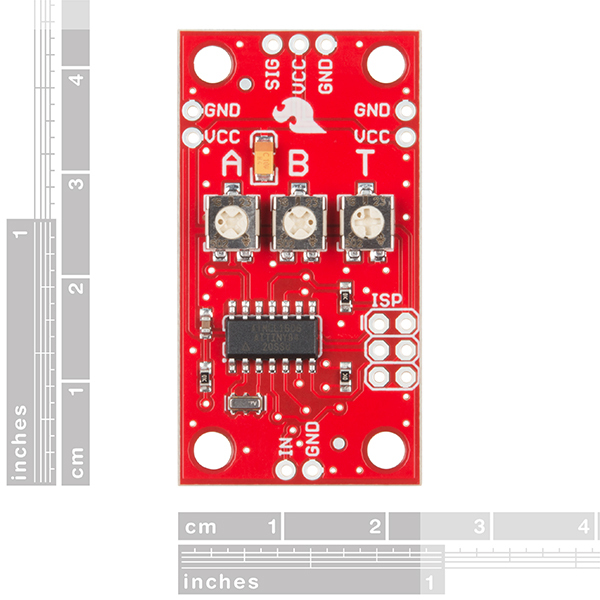 - Add a third servo position and have a separate input for it or have three input bits. The ability to just ground an input for the position you want is very powerful and convenient. A 2 to 3 Mux/Decoder can be added by the user. - Reduce the price. Is the sketch code available? Agreed on the header thing. And it needs another pot for the speed of the return stroke, too. May I ask what goes into deciding which Attiny chip was selected?? Sort of why Attiny84 vs. 85 vs. ?? and the like. Three ADC pins for the pots. One pin on a timer output for the servo control, configurable as PWM of suitable period & pulse width. A 16-bit timer, with a 1 MHz clock, let me have 1 uSec pulse resolution, which is better than many servos. One pin for the switch input. In-System-Programming & debugging make development easier, but can constrain how those pins can be used by the application. If I hadn't had the single wire debug, I'd probably still be working out bugs. Some extra pins for configuration jumpers were a bonus...in the end, I came up with even more modes than I had jumpers for. Of course, the pins and peripherals also have to be setup such that the functions aren't mutually exclusive. That caused some problems with the 8-pin Tinies that I looked at. Second, availability. We already use the 84 in the Tiny USB Programmer stick, so it's a part that's already in our pipeline. We also have the DIP-14 version in stock, which I built my initial prototype around. So, yeah, pins and availability. Can I use Attiny84A instead of Attiny84? I guess I can't since Attiny84A has only 1 PWM, doesn't have UART and I2C. Could you please confirm? It's also not very clear which voltage should capacitors have - I have ordered 6.3 DC. Is it correct? Thank you very much for what you have been doing. That depends on what you are trying to do. The board comes populated and programmed, but if you are trying to build your own it depends on what feature changes you want and what pins they would need. I am trying to assemble the same servo trigger board and I don't need any feature changes. The reason I am asking - I would like to build this using the brd files provided. I am now trying to purchase Attiny84 but it's twice as expensive as Attiny84A. So I would like to know, whether I can use Attiny84A. 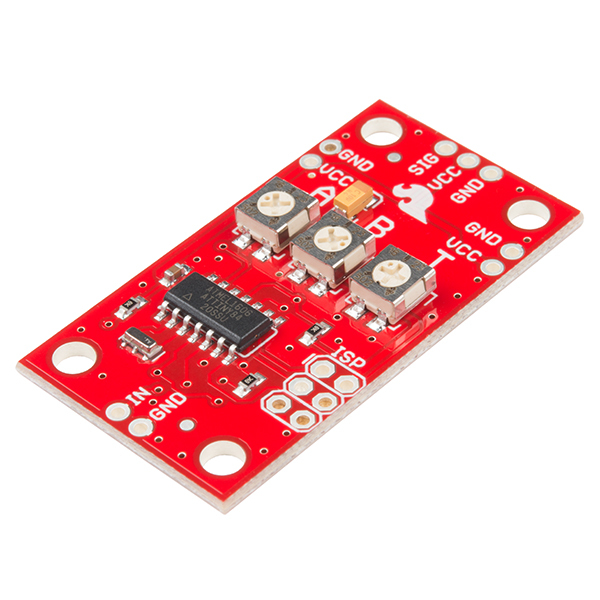 It's not clear whether second PWM, UART and I2C are used in this project. Or are you trying to tell that building this is not possible? Thank you very much in advance. According to Atmetl the ATtiny84A is a functionally identical drop-in replacement so it should work fine. As for the capacitors, the voltage rating is really how much voltage they can handle, we use a 16V and a 25V on this board, but we use those parts on a lot of boards so we've selected values that will work with most of our boards. I am asking, because I have noticed that Attiny84A has only one PWM timer, instead of 2 in Attiny84. It also doesn't have UART and I2C. So it would be good to know, if Second PWM timer, UART and I2C are used in this project. Where are you seeing that. I'm looking at the 2 datasheets and the pinouts with all pin descriptions is identical for both the ATtiny84 and the ATtiny84A. Neither has UART, both have I2C and the datasheet says "two PWM Channels" for both chips. It would be nice to be able to some how "read out" the PWM values that the CPU is actually using. I can see a use for this in that you could use it as a "calibration harness" for a more sophisticated robot -- unplug the servo from the "normal" controller, temporarily plug it into a WIG-13118 and adjust the range to get the "end points", read out the values to put into the "normal" controller, move the servo back to the normal controller, and repeat for the next servo. Yeah, you could guesstimate the values from the pot positions, but a digital readout would be more accurate. That poor lil' Tiny84 is almost out of pins. The only ones currently unused are MISO and SCK, not quite a full SPI bus. You could conceivably bit-bang an output on those pins (write-only 2-wire SPI, or bit-banged UART), though. Thinking about this a tiny bit more - 50 BPS is a very low, but standard, baud rate -- you'll see it in some terminal programs. It also happens to match the servo pulse rate! You could add a tiny bit of code to print out the pulse widths from within the timer IRQ. Alternatively, you could use a second microcontroller, with a timer in input-capture mode to measure the pulse widths, and display them. Or just use cursor mode on an oscilloscope. And now, having had the weekend to turn this over in my head, it sounds like it might be a great project to tackle with a Microview. Under the idea that "the only stupid question is the one that isn't asked": What happens when you hook one of these to a continuous rotation servo? If you set it correctly, "A" sets how fast it drives one direction while the switch is open, "B" sets how fast it drives the other direction while it's closed. "T" Sets the time it takes to decelerate, re-accelerate when the switch changes state. You could also set it so it's stopped at "A" and moving at "B", or vice versa. Keep in mind that continuous rotation servos have an internal trimpot that sets their center-point response, and that will interact with the A and B settings. If you want to load different firmware, there's a toggling mode that I devised to control continuous servos. It'll run one way until a switch closure, then run the other way until it closes again. I built a little cart with switches in the bumpers that would drive back and forth using it. Check the Expert Exercises in the hookup guide, and get the firmware from GitHub. This uses analog potentiometers to control analog parameters (timing), but it does it with a digital microcontroller. I remember the days when this would have been implemented with a couple of timers and perhaps a shunt transistor or analog switch. In fact, I'm tempted to grab a 556 and 4066 and give it a try. Reminds me of the time, maybe 20 years ago, when I took a class in OOP, and as a "demo" we wrote a program to simulate a (no sensor) traffic signal. I was first playing with PEEL (and electrically erasable PLA), and "simulated" the 60 or so line program with just two ICs (the other being a 555 to generate a roughly 1 Hz clock). Great idea. Wish it went more than 90 degrees. Everything about this is excellent, except the limited range. I had some projects in mind that would utilize the full 180 range of a servo, so the fact that this limits this by HALF is a bit of a disappointment. I'm using these triggers with servo motors to control model railroad track switches. They work perfectly and allow me to slow down the movement to more closely model the real world. The only thing I don't care for is that since virtually all servo motors are prewired with standard width female pin connectors. So why aren't the pins installed on the trigger card? It would be nice if the range was > 90Â° in my case the full 180Â° would have better for my application. If you are looking for a project to work on as someone new to electronics, or something that is fun to work on with kids, these are really great. No programming involved at all. A perfect way to get straight to building the mechanics with immediate results. I would of liked some of wiring instructions and instructions on how to use it. Alternative to "rolling your own" device to turn servos into shutters, etc. I used this as an alternative to Pololu's Micro-Maestro for similar devices, one with only 1 servo and the other with 3 servos. This little board worked great for my application. I have built a suspended model railroad in my man cave around the ceiling. I had mounted above a doorway two lionel gate crossings that had noisy buzzing inductive motors in them. I replaced the electronics with servos and these little boards to control them. For the gate movement I needed both a start and stop position with speed control to achieve a very realistic look. The crossing gates now work and move perfectly with no buzzing. I can see these little boards being used in many model railroad applications. Works as advertised. A very handy board! Hooked this up to the output from an IR sensor and it gave me great control of the two positions of the servo depending upon the presence or absence of the IR beam on the sensor. The pots are a great way to control the positions. Kudos!